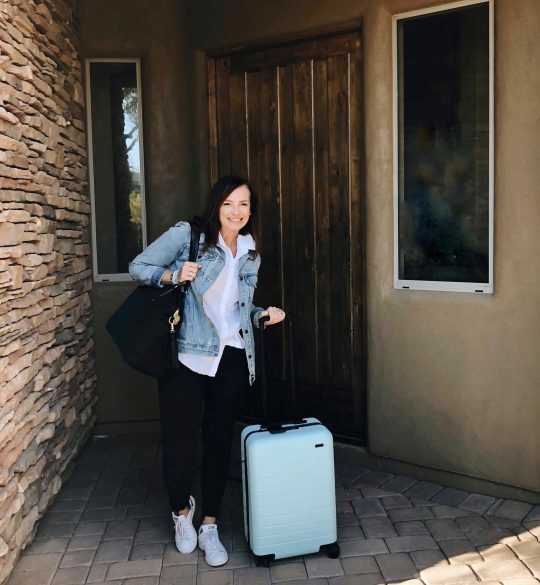 Since making the switch to carry on travel, many have asked how I’ve pared back enough to ditch the big bags, especially when packing for longer getaways. I have to say, I feel like it’s been a process but slowly I’ve found what works and have gotten it down to a system. And now? The thought of lugging around an unwieldy suitcase that weighs almost more than myself, kinda makes me shudder! Not only was it a royal pain to move around, but I found myself packing way (WAY) too much stuff. It wasn’t uncommon for me to come back home and unpack clothes that never even got worn while away. With a little planning ahead, the truth is I don’t need a ton of clothes. The strategy is to pre-plan most of my outfits using pieces that can be worn multiple ways. 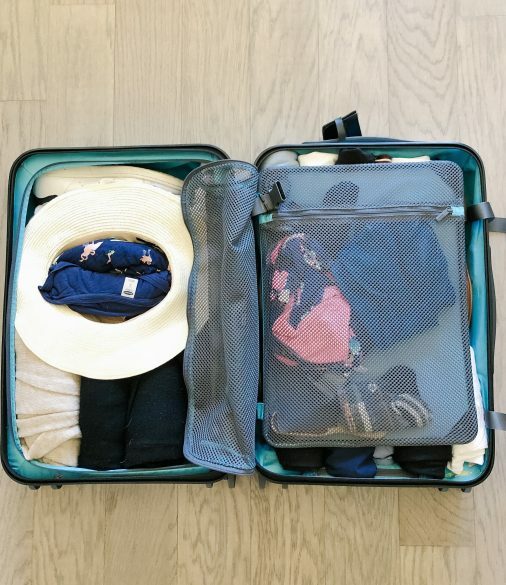 If you’re like me, you tend to keep wearing your favourite pieces anyways…those are the items you should be packing for carry on! The other bonus of doing a little pre-planning is that it takes away the guess work once you’re in vacay mode. Your outfits are set and really there’s just less stress. It kinda all starts with a great carry on. I spent a lot ( A LOT) of time researching what bag would be the best for me. 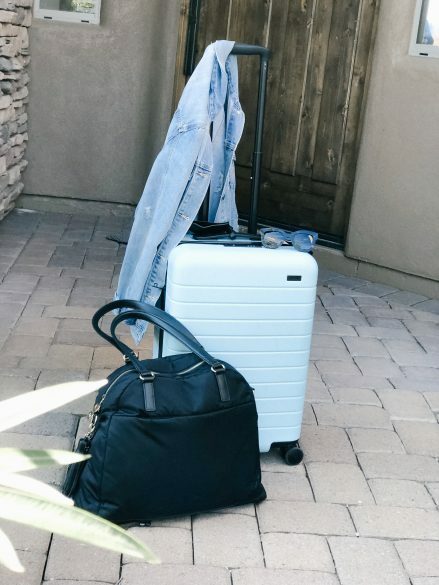 I decided on the Bigger Carryon by Away and I’ve never looked back. Why did I choose it? Space was paramount and this slightly bigger version honestly fits everything I need. Many have asked if its size has been too big…thus far, I’ve never had a problem fitting it in the overhead bin. (If you fly smaller planes, alway be sure to check their carry on allowable measurements.) This suitcase also comes with an ejectable battery that allows me to power up my technology on the go. It’s such a handy feature and I don’t have to worry about finding a charging station in the airport. First, as I mentioned above, I plan my outfits. Mentally, I’ll go through and figure out how many “night outs”/mornings to exercise /poolside days are on the agenda and pack accordingly. This means that I’m not just throwing in every swimsuit I own or multiple workout outfits. I choose fewer pieces that can be worn more than one time (ladies, we won’t blow up if we wear an outfit more than once on holidays lol!). A staple pair of pants like these can transition from walking to dinner out… I have them in a couple of colors! A basic white blouse is also incredible versatile as a layering piece. On the shoe front, I choose shoes that are neutral that will take me the distance…here’s a favourite pair. Second, I roll my clothing. It’s taken me a long while to subscribe to this but I’m a convert. 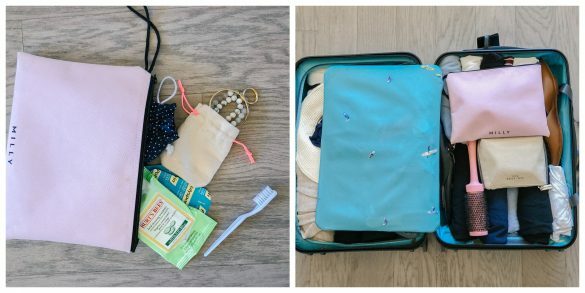 Its the most compact way to pack and I find it helps alleviate wrinkles and fold lines. A little tip is to pack your wide brimmed hat upside down and stuff it with smaller items. (I usually place my pyjamas in there). Third, compartmentalize as much as possible. I do this by using a number of pouches. I have my liquids in one, a tech one, a medication/supplement one and a fourth which holds my jewelry, hair ties/bobby pins, and misc. I also have a small pouch that holds all my makeup…the brushes, powders, liners etc. When you’re trying to keep things compact and organized, I find these pouches are the best way to do it. Everything has a home. 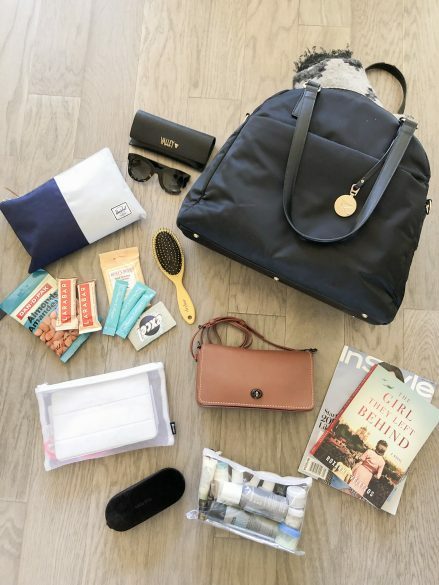 My carry on tote is also a beloved piece…it has all sorts of compartments that help keep me organized. It’s kinda magical because I can’t believe just how much I can fit into it! I’ve included a list below of what I keep stowed in the bag. 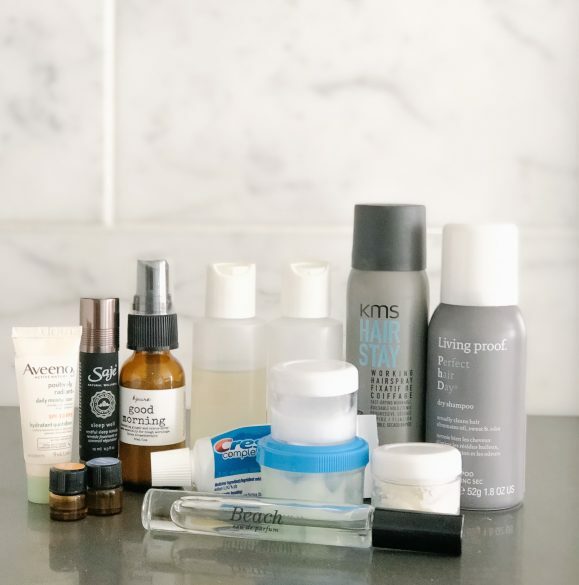 But let’s address the most asked and possibly dreaded question first: how do you pack your travel liquids? 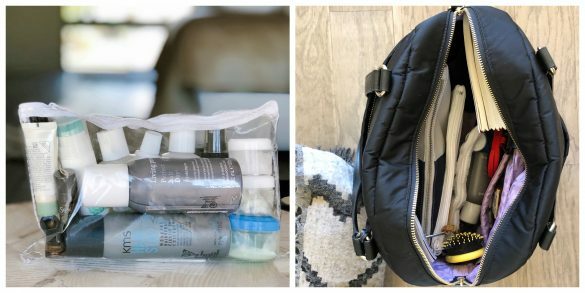 The all important packing of liquids is something I’ve failed at so many times… there were a couple of back to back trips where I got tripped up lol! Any of you who follow my instagram stories would have seen my meltdowns after getting lambasted at airport security hahaha! I think (fingers crossed! ) that I’ve finally got it figured out. What “figured out” means is that I’m able to fit all that I need for up to 2 weeks and still be within the allowable liquid limits. That’s a lot… right?? It’s all about finding the right sized bottles/containers. Individual bottles must be under 100ml. I use mini bottles (like these) for essential oils…and while I know that oils are “extras” to pack, they are the little things that make me feel cozy and at home while I’m away. The bottle set that I use for my hair products is similar to this . This is also a similar clear bag. Walmart also has small little containers that I use..I found them in the food storage aisle. I’m all about the ones that don’t leak…ugh…haven’t we all had that happen at one time or another?? Anyways, food storage ones don’t leak! I also love brands that make smaller, travel-sized products like K’Pure. This deodorant is one I often travel with. And the skincare package is also perfect! *I always keep my liquids accessible so that I can take them out easily at security. *The blanket scarf is a total necessity for me even when flying to warm destinations because it’s always so cold in flight! It’s kinda my security blanket. 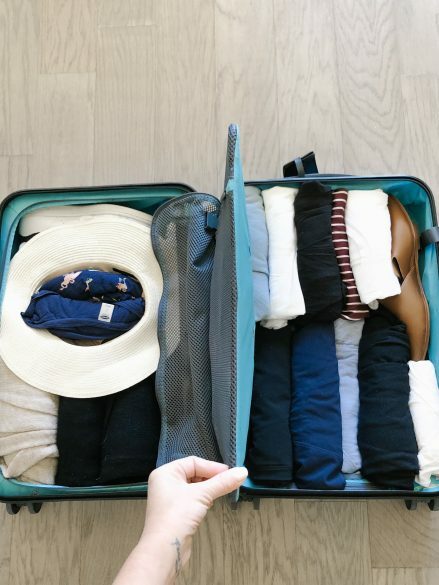 *Wear your heaviest/most bulky items when travelling instead of packing them. A pair of sneakers takes up valuable space..and on the upside keep you comfortable on your travel day.